We offer Educational Writing Slates in various themes and designs. Our main motive is to make learning a fun activity. Our product range includes fun-and-learn slate, alphabet fun slate and dragon slate. Fun and Learn Slate is a smart idea for smart kids. This beautiful slate is designed to make learning a fun activity for your kids. The contents include writing or chalk board, marker, duster, chalks with collapsible handle and removable stands. Available in colors of green and pink, this fun and learn slate is available in a standard size and weight. It is manufactured using raw materials that provide a safe use. Alphabet Fun Slate is a double sided slate that offers lamination from one side while the other side of the slate has a match and learn alphabets tray. Our clients can avail this unique slate in blue and pink color. It comes with a white board marker, a duster and 26 alphabet pieces. The raw material used is safe and does not cause any harm to the kids. It is a long lasting product that offers an easy usage. Contents 26 Pcs Alphabets, White Board Marker, Duster. Size 36 cms. x 26.5 cms. 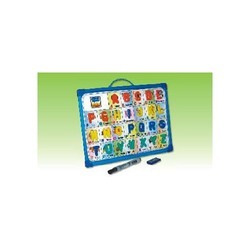 Double Sided Fun Slate One Side Laminated Surface, Other Side Match & Learn Alphabet Tray. Contents White Board Marker, Duster, Chalks. Size 41 CMS. x 35 CMS. Double Sided Fun Slate. We presentSenior Fun School Slate. that includes various contents such as writing and chalk board, marker, duster, chalks and a stand. 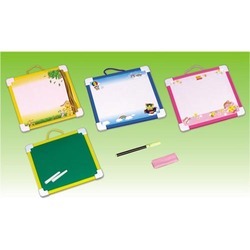 Fun slate jr. can be availed in pink and blue color, in standard size and weight. It should be kept away from strong sunlight as it can affect the surface of the slate. It is manufactured from safe and non-hazardous material so you don’t have to worry about the safety of your child. Dragon School Slate is manufactured from excellent quality raw material that is safe to use. 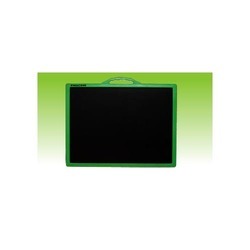 It offers writing and chalk board, marker, duster and chalks. Available in multiple colors and attractive design pattern, this dragon slate is easy to clean and use. It proves to be one of the best ways to teach children about alphabets and writing. It is advised to keep this slate away from strong sunlight as it can damage the surface of the slate. We present Mini Fun Slate manufactured from non-hazardous raw material. Slate contents include sketch pen, duster and chalks. It can be availed in blue, pink and yellow colors. This double sided mini slate is smooth to write on and easy to clean. You can easily wipe off the written contents using a soft dry cloth. It is an amazing idea for kids who like to play while learning. Size 18 cms. x 19 cms. Double Sided Fun Slate. Fiber School Slate has a polypropylene frame and a fiber board. It is available in a standard size and weight. The board is green from one side and black from the other side, and offers a good writing surface. It comes in a simple yet unique design and is easy to carry. A smooth dry cloth can be used to wipe the surface of the board for reuse. We manufacturing we ensure that the raw material is safe and offers good quality. Looking for Educational Writing Slates ?